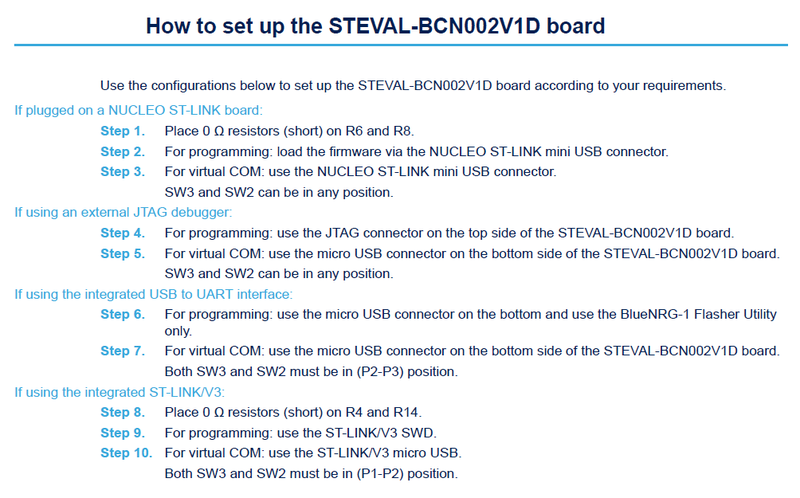 STEVAL-BCN002V1D adapter board is used to program and debug the sensor board and supply power to the sensor board. The adapter board is powered via USB. 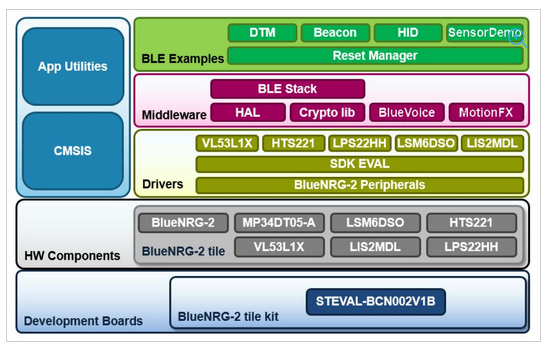 BlueNRG-2: Bluetooth Low Energy (BLE) single-mode system-on-chip. The BlueNRG-2 is compliant with Bluetooth 5.0 specifications and enable the usage of the embedded Cortex M0 to run the user application code. BALF-NRG-02D3: ultra-miniature balun and harmonic filter. LSM6DSO: is a system-in-package featuring a 3D digital accelerometer and a 3D digital gyroscope boosting performance at 0.55 mA in high-performance mode and enabling always-on low-power features. LIS2MDL: is an ultra-low-power, high-performance 3-axis digital magnetic sensor. VL53L1X: is a state-of-the-art, Time-of-Flight (ToF), laser-ranging sensor, enhancing the ST FlightSense™ product family. It is the fastest miniature ToF sensor on the market with accurate ranging up to 4m and fast ranging frequency up to 50 Hz. Housed in a miniature and reflowable package, it integrates a SPAD (single photon avalanche diode) receiving array, a 940 nm invisible Class1 laser emitter, physical infrared filters, and optics to achieve the best ranging performance in various ambient lighting conditions with a range of cover window options. Last but not least, is Pin-to-Pin compatible with the VL53L0X(range up to 2m). MP34DT05TR-A: MEMS audio sensor omnidirectional digital microphone, 64 dB SNR, -26 dBFS sensitivity, top-port, 122.5 dBSPL AOP ( Acoustic Overload Point ). LPS22HH: is an ultra-compact piezoresistive absolute pressure sensor which functions as a digital output barometer. The device comprises a sensing element and an IC interface which communicates through I²C, MIPI I3CSM or SPI from the sensing element to the application. HTS221: is an ultra-compact sensor for relative humidity and temperature. It includes a sensing element and a mixed signal ASIC to provide the measurement information through digital serial interfaces. CR2032 battery powered (not included). 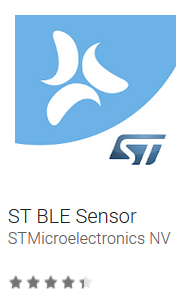 The sensor board communicates with a Bluetooth LE enabled smartphone running the ST BLE Sensor app, available on Google Play and iTunes stores. 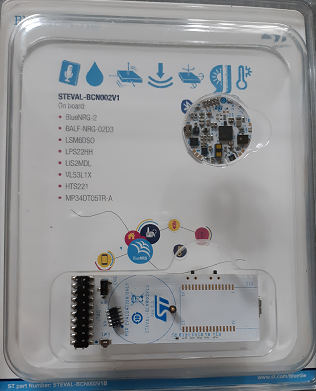 STSW-BLUETILE-DK – Software development kit for the BlueTile, including sensor data streaming over BLE, HID peripheral, Beacon, etc. The STSW-BLUENRG1-DK package supports the BlueNRG-1 and BlueNRG-2 Bluetooth Low-Energy system-on-chip. This package includes a Wizard PC application to automatically generate the configuration header file needed for the BLE radio initialization. This package also includes BlueNRG-1 and BlueNRG-2 peripheral drivers and related examples, the BLE firmware stack together with the HAL (Hardware Abstraction Layer) and CryptoLib (Cryptographic Library).